Designing a hallway? Whether narrow corridor, compact boot room or generous space, all hallways need good lighting. A hallway lighting scheme which incorporates various elements rather than leaving one light struggling to do all the work will make the most of a hall’s proportions whatever they are, provide adequate illumination for the tasks that take place there, and create a great first impression of a home. How to tick all the boxes? We have the answers. 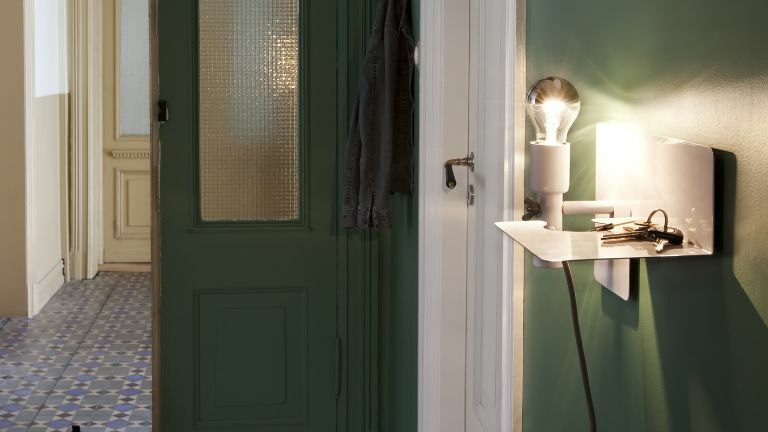 What types of hallway lighting do you need? Just like for the other spaces in your home, there are three types of lighting you need to consider for your hallway. The first is the ambient lighting. This is the overall light that allows you to use the space, and it functions as good daylight would. Next comes task lighting. This is the illumination that allows you to perform specific actions. If we were talking kitchens, this might be chopping and mixing; in the living room it could be reading or sewing, for example. In the hall? If it’s big enough, you might have a desk area in which to work, but even in a small hall you might need concentrated light to check your appearance before you leave, for instance, or tie shoelaces. Finally, there’s feature or accent lighting. This draws attention to a particular aspect of the space. In the hallway that could be artwork on the wall, or a mirror, or perhaps a piece of furniture. However, it could also be used to wash light over a wall, for example, creating a decorative effect to add interest to the space. The ambient light for a hall could be provided by a pendant light hung from the ceiling. Remember, though, that it’s there to light up the whole space, rather than leaving some parts of the entranceway in shadow. Dark areas will make a hall feel smaller than it really is, and inhibit easy circulation through the space. If a single pendant isn’t going to cut it, think about hanging a series of them down a long narrow hallway just as you might over a dining table or kitchen island. As well as providing even light, they’ll make an appealing and contemporary feature. Alternatively, a single pendant can be combined with wall lights to provide adequate background light for the whole space. It’s worth considering dimmers so you can soften the ambient hall light when you want. A bright hallway seen from other living spaces that are lit in a more subdued fashion in the evening can be overbearing. If your hall has a high ceiling, go for suspended lights or a chandelier – traditional or modern – to introduce an impactful focal point in the lofty space. Keep lighting designs in proportion to the area. For example, if your hall is large, pendant lights need to be sized up whereas, in a small entranceway, sizeable wall lights could stop you moving easily through it. Think lampshade colour if you’re using pendant(s) with a shade. Pale colourways enable the light to diffuse through the sides but dark versions may not let enough light through. Recessed ceiling lights can be a good solution if the height of the hall isn’t generous, as can scaled-down downlights. The layer of lighting that you add to enable you to achieve a goal, or boost illumination in very specific areas is just as important in a hall as elsewhere in your home. Consider adding in low level wall lights that will brighten the floor area to enable everyone to move comfortably through the space. These are also worth considering for lighting the staircase, where they can illuminate each step to make going up and downstairs safer. Bear in mind, too, that while functional, these lights do a decorative job as they wash light over the floor, so they can be well worth investing in. If you need to check your do and your lippy as you leave the house, wall lights either side of a mirror will give you good light without shadows for accurate last minute adjustments. A table lamp on a console or side table on which you keep the essentials you need ready to grab when you leave the house can also be a worthy addition to a hall’s task lighting armoury. A generously sized hall can be a suitable venue for a home office area if there’s space going begging and you don’t have the benefit of a separate room or dislike the idea of giving up part of a bedroom or living space. To provide concentrated light for the desk’s surface, you’ll need a dedicated desk lamp. The rule here is that the bigger the desktop, the taller the lamp needs to be. Those that can be angled are more versatile. This is the lighting that’s going to play the largest role in making your hallway stylish and decoratively interesting rather than just a space to pass through. You could choose spotlights you can angle to highlight a feature such as artwork you’ve hung, or a mirror. If the walls of the hall are painted in a pale shade, the light from them will also reflect back into the space to make it seem larger than it really is. Try downlights to wash light, er, down, transforming a plain wall into an attractive part of the hall. Alternatively, look for attractive wall light fittings that will focus light both up and down the wall to create eye-catching light and shade patterns. For an elegant effect, opt for wall lamps with drum shades that’ll throw light evenly both upwards and down. Uplights can also put the focus on art that’s hung on the wall of a hallway. A table lamp can add a soft pool of light to show off a display of decorative accessories. For a super-smart look, place a matching pair either end of a slim piece of hall furniture, or use just one for a more casual – but still stylish – look. Do include a range of light sources in the hall – however small it is – to make the space richer in detail and allow changes of mood. Do think about positioning a feature light at the end of a hall to help draw the eye down the space to make it feel bigger. Don’t forget to light any landing areas that you can see from the hallway to avoid having an unwelcoming dark area on show. Do look for shades and light fittings with cutouts and lattice details that’ll throw elaborate light patterns.